I started blogging last year and I have been reading a lot of positive feed backs about Nuffnang so as a newbie blogger I also joined them. Now my blog is a year old with Nuffnang and I am happy to say that I am one happy member. Nuffnang gives a warm experience to Nuffnang bloggers like me. They have invited me to several great events like intimate Johnson’s luncheon with Judy Ann Santos-Agoncillo at Johnson’s Milk bath press release and I also won from a Loud Tommy Hilfiger Contest. Isn’t it so hot? Nuffnang made their bloggers so warm with these hot events and prizes. Now It is even hotter with Pizza Hut that offers Hot on the Dot Pizza deliveries: 30 minutes AND hot (as indicated by the thermally activated sticker you place on the pizza box upon receiving your pizza) or your pizza is FREE! I love eating pizza hut. Pizza hut products are yummy, freshly cooked, healthy and now even better with the hot on the dot pizza delivery. 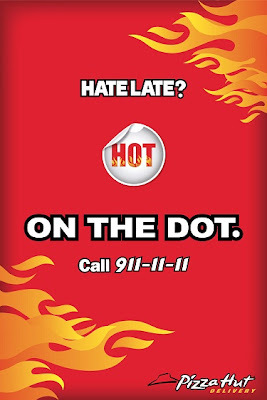 Just dial 911-11-11 if you want your pizzas Hot on the Dot! This entry was posted in Blog Contest, Review and tagged hot on the dot pizaa hut delivery, pizza hut, pizza hut hot on the dot. Bookmark the permalink.